Until just recently, I never really thought about this passage as relating to Christmas. But think about it for a moment. A God who is so madly passionately in love with us, sent His son to live up close and personal here on earth. 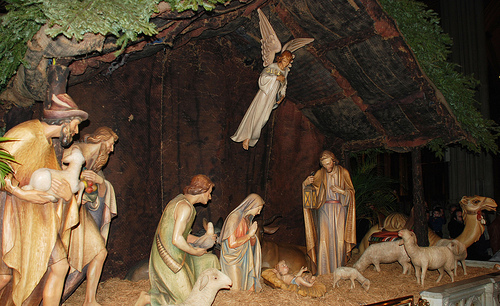 Christmas is so much more than the celebration of the birth of a cute little baby. So much more! The book of Genesis talks about God coming and walking in the cool of the day with Adam and Eve. We were created to have a very close relationship with our creator. When Adam and Eve sinned, our relationship was broken and no longer could mankind get up close to God. Throughout the Old Testament the Priest had to represent the people before God. The people could not go themselves. Here is the incredible thought. God wanted so badly to restore our relationship with Him, He sent His own son to live in the flesh as a man. He then gave His son to do die on a cross to pay the price for our own sins, so once again we can have a close relationship. God wanted so much to have a relationship with us He gave the greatest gift of all, Himself. Jesus no longer walks the earth as a man, but he sent his Holy Spirit to dwell in our hearts. Wherever we go, God is with us. And now the Word becomes flesh in us as we live our lives as a testimony to the love and grace of Jesus Christ. Yes, at Christmas we celebrate the birth of Jesus, but it is more than just seeing a cute little baby. We celebrate the joy of a Holy God that loves us so much that He came to live among us. The Word became flesh! !